The Sunshine Coast gets an average of 300 days of Sunshine a year but we arrived on the one of the other 65. Despite grey skies and a bit of drizzle there was no way we were going to sit around as we only had a weekend to explore this beautiful part of South East Queensland. We were in Mooloolaba so we decided to head for the Visitor Information Centre on Brisbane Road to see if they could point us in the right direction for some fun out of the sun. Keen to stick by the coast on the Saturday and then head inland to the hinterland on Sunday, the friendly guides rattled off a week full of all-weather suggestions, starting with one of the biggest attractions on the Sunshine Coast - not to mention the one closest to us –- Underwater World Sea Life Aquarium. Located in Mooloolaba Wharf and surrounded by a boardwalk style shopping village, Underwater World is not so much an aquarium as it is a giant marine entertainment and educational experience. It covers mulitple zones including Touch and Tell, Weird and Wonderful, Seal Island, Otter Empire, Fresh and Freaky, Billabongs and Backyards, Sharks Alive and Crawly Creatures. As we wandered around we saw it all; rays, starfish, sharks, the entire cast of 'Finding Nemo', a blinding array of fish life, weird-looking sawfish, freshwater crocodiles, frogs and all sorts of crabs – including my personal favourite, the Giant Japanese Spider Crab, which fully grown can reach a leg span of almost four metres, a body size of up to 37cm and a weight of up to 20kg. We also took in a couple of shows with sleek seals moving through the water like furry torpedoes and cheeky otters (one even ended up in my lap). By the time we'd finished at Underwater World, it was lunchtime and we opted for our own refuelling rather than hire a jetski or stand-up paddle at the Sunshine Coast Adventure Centre right next door. Our aim was to road test a local Surf Club. 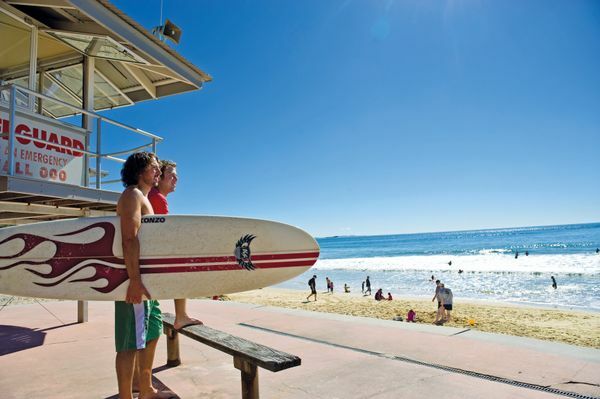 One of the oldest clubs in Australia, Mooloolaba Surf Club also claims to have one of the best locations of any restaurant on the Sunshine Coast, perched right next to the Pacific Ocean, the beach stretching out before it. We headed straight for the Boathouse Restaurant, grabbed a burger and a beer and watched the world and the weather go by, easily whiling away a couple of hours without the distractions of work or home chores. Eventually we decided to tear ourselves away before we wore a groove in our ocean front seats. While madam was hoping for a luxury massage treatment at one of the spa venues on the coast, this was a weekend for two and we decided to do something we hadn't done in years… go tenpin bowling. Suncity Tenpin is just up the road at Alexandra Headlands so off we went to see how we rolled! Feeling like fifties mobsters (or perhaps Ronald McDonald) in our two-toned shoes we grabbed a snugly fitting ball and hit our allocated lane. We spent the afternoon perfecting our technique, rolling a couple of strikes and laughing a lot. There was even a bit of spin technique happening by the time we finished. In a matter of hours, we learned how to whip up Thai Beef Salad and mastered the art of Chicken Satay on the BBQ. Best of all, we got to taste the fruits of our labour. It was a great way to spend the morning and the class was relaxed, informative and fun. After cooking up a storm we headed west to the quaint hinterland village of Montville to check out the galleries, arts, crafts and cafes. Montville is perched on top of the Blackall Range and it's known as the artistic hub of the Sunshine Coast. It was at its charming best, with the misty atmosphere seeming to muffle everything around us like airborne cotton wool. For those who are feeling a bit more active, close to Montville is the Kondalilla National Park. Kondalilla is aboriginal for 'rushing waters' and is home to scenic walks and spectacular waterfalls, which are at their most magnificent given the recent rain. Visitors to Montville can also access the Sunshine Coast Hinterland Great Walk, a 58- kilometre walk through the hinterland that is easily accessed from Montville. The cooking school offer on the Sunshine Coast is incredible and includes the delectable, Long Apron classes (at the beautiful Spicers Clovelly Estate), Life's a Feast (in Noosa) and Amytis Gardens Cooking School in the hinterland. There are some delightful museums dotted around the Sunshine Coast region including the Queensland Air Museum (Caloundra) the Woodworks Museum (Gympie), the Landsborough Historical Museum (Landsborough) and the Gympie Historical Gold Mining and Historical Museum. Active Adventurer s will get wet whatever the weather with Kanu Kapers a self guided kayaking and canoeing tours to the Noosa Everglades or dive around the ex-HMAS Brisbane Conservation Park, the only former Navy dive wreck in Australia that allows divers to explore both the forward engine room and the boiler room as well as discover the living and sleeping quarters used by crew. Stephanie's Spa at Noosa Outrigger Resort, Noosa has been voted Best Spa in Australasia and offers a cocooning approach to pampering, Spicers Retreats in Maleny and Montville serves up sanctuary within a sanctuary while the dedicated Iketan Day Spa in Noosa will remind you of your last trip to Bali. This Copyright Free Story is supplied courtesy of Tourism and Events Queensland and is for media use. For more information, please go to www.queensland.com or blog.queensland.com. For images, please visit http://teq.lookat.me.com.au/. If you wish to reproduce this content in the online space, please contact the Tourism and Events Queensland Publicity Team.